We've all seen energy build up in toddlers, preschoolers, or big kids. But you can usually redirect this energy with a fun little game. At the same time, you'll be helping to develop your child's physical control and something called "inhibitory control," or his or her ability to start and stop behaviors. Sometimes, all you need to do is turn on some music and play Freeze Dance! • Get some lively music going. • Dance around with your child or encourage him or her to dance — let your child burn off some of that energy! • Every so often, quickly pause the recording — everyone (including you) should immediately freeze! • To spice things up, after each freeze you can call out a new dance word like twirl, twist, leap, wiggle, or turn. • Now start dancing like that until it's time to pause the music and freeze again. Don't have any music handy? No problem! Sing a song or bang a funky rhythm on something you have lying around the house. Stop at random times, just like you were pausing the music. Redirecting your child's energy into a fun game or activity can work like a charm. Try it next time you see your little one developing a case of ants in the pants! Spring means baseball . . . musical baseball! Bowling Green, KY, educator Mary Anne Kell recently sent us this fun little note and picture. With spring and baseball season around the corner, we thought it was a good time to share it. "Just wanted you to know about another exciting Kindermusik activity. Our Young Child classes have always enjoyed playing musical baseball. However, this year was special! The class was thrilled to be GIVEN baseball caps by our new professional baseball team — the Bowling Green Hot Rods — to wear while playing musical baseball. We are working with the Hot Rods office to attend a game in the spring so the girls can throw out the first ball. No doubt about it, Mary Anne! Kindermusik has over 5000 super-talented, super-dedicated Kindermusik educators around the globe. But at Kindermusik International, or (to use a term we never use) “Corporate Headquarters,” we’re a small, tight-knit group of employee-owners – KI is 100% employee owned. KI is a second family to many of the folks who work here. So when someone leaves, it’s always a very sad event. Last year one of our favorites, Lisa Rowell, left the ranks and moved to Atlanta with her husband and two girls. Lisa, Ellery, and Emmy are pictured to the right, enjoying the oh-so-common Atlanta snow (it sure has been a strange winter in many places). While at KI, Lisa worked in marketing and, as anyone who knows her would agree, was one of the most funny, smart, silly, and engaging people you could hope to share an office space or conference call with. We all hated to see Lisa go. So we were delighted when we recently learned Lisa was still part of the Kindermusik family, although in a slightly different way. Below is a note she sent to our CEO, Michael Dougherty. With Lisa’s permission, we’d like to share it here. It was so nice for us to hear from Lisa, and the note also touches on so many of the fantastic aspects of Kindermusik – the sense of community, the time spent focused on family (both in the classroom and at home), the head start on learning, and of course the unbridled fun! Thanks, Lisa, for keeping in touch and for being part of the Kindermusik family. Those two words are not written as a former Employee-Owner, although they certainly could be. During my seven-year tenure, I experienced a remarkable culture composed of talented, driven, and focused individuals, who made the decision to bring music into the lives of thousands of families. Instead, these words are written as a Kindermusik parent. It has taken me 13 months to write this letter, because frankly, it took me that long to be “just a parent” in the classroom. I am no longer privy to strategy and budgets and marketing campaigns. The daily challenges and opportunities of being an Employee-Owner finally feel more distant than present. Now when I enter the classroom, I no longer think of it as market research or worry that my daughters won’t act “Kindermusik enough” for the other parents. Instead, I enter the classroom as just Emerson’s and Ellery’s mom. In the fall, we took a Kindermusik hiatus, partly so we could settle into our new community and partly because the closest Kindermusik educator just had a baby. However, like other parents in the Kindermusik bulls eye, Clay and I want the best for our girls so we enrolled in Jane Hendrix’s program in Dunwoody (Our Time and Imagine That!). It was like coming home. Our Imagine That! class includes other Atlanta transplants, who like us, sought out the familiarity of Kindermusik. We meet at 12:30 on Wednesdays for lunch in the classroom before the class begins at 1pm. These parents and children bring with them the experiences of other Kindermusik educators. Educators from California, Texas, and even Australian are represented. This is the type of Imagine That! class that we dreamed about: parents, children, and educator forming connections with each other that extends well beyond the classroom. The joy my daughters’ experience in the classroom and at home is unique to Kindermusik. Our daily lives are filled with hayrides, bumpy rides on red wagons, Johnny and Katie finger plays, family jams, imaginary trips to toy stores, multiple readings of Shiny Dinah or Noodles from Scratch, and even puppet shows courtesy of Wags, Hopper, and Rascal. There are moments when my extremely verbal four-year-old becomes so excited to be in Jane’s class that she loses her ability to speak clearly. As an infant, “My Bonnie” from You Are My Sunshine calmed Ellery unlike any other song. This became the final song I sing to them at night. Initially a solo act, my voice is joined now by both my girls. To the outside listener, our voices sound more “Tarzan, Frankenstein, and Tonto” than “Emmy, Ellery, and Lisa” but to me it is pure beauty. This is a moment that only the heart will ultimately catalog. Kindermusik helped create these moments in our family. Thank you, Michael. I know these words will not reach every person who contributed to the wonder of Kindermusik. Through the years, the names and faces change, but the mission remains the same: To put a song in the heart of every child. Thank you, Kindermusik, for putting an entire symphony in the hearts of my girls. The more you expose your baby to language, the stronger his verbal skills will be. Language acquisition is a gradual process that involves many facets of development including listening, imitating facial expressions, playing peekaboo, and babbling. Your child will learn language naturally by hearing it used in context when you sing, read, talk, and listen to him. • Your Baby: At two months, he coos and babbles. In his first year, he’ll begin making vowel sounds (oohs and aahs), and then move to new sounds and vowel-consonant combinations. Your baby is also learning the art of conversation. Bring your face close to his, and talk to him. Ask him a question and let him respond. He is learning that conversation is a two-way street. • Your Toddler: In a verbal growth spurt, your toddler’s vocabulary expands from about 50 to 200 words. When your toddler displays emotion, give him the language to identify it. 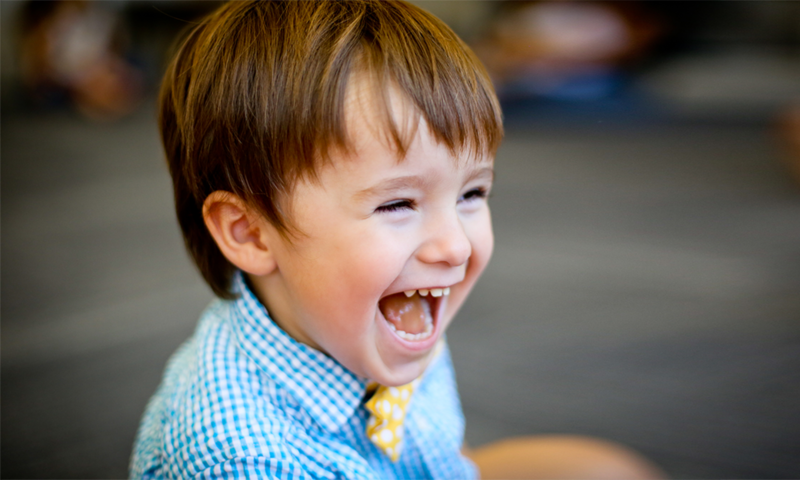 “You’re happy!” or “I can see that you’re sad.” You’ll enhance his emotional intelligence as well as his vocabulary. • Your Preschooler: Playing rhyming games is a fun way for a preschooler who is developing phonemic awareness – the recognition that sounds make up words. Encourage him by making up rhymes and laughing together. In Kindermusik class, we tell parents that simply having their child in an interactive musical environment has huge impact. This impact usually goes well beyond what we are seeing in class. (For example, a child may initially be shy about singing in class. At home, however, she will sing the class songs all the time! We know she's learning and abosorbing). When it comes to music, listening equals learning. Most parents instinctively recognize the power of music and want to do all they can to foster their child’s musical interests and development. One of the easiest things you can do is surround your child with an active musical environment. Kindermusik International’s experience over the past 30 years has shown that for young children –- baby, toddler, preschooler, or big kid — there’s no better way to listen and learn than with us! Check out Kindermusik Play, our new e-music site to preview and download some of our music. Have a listen with your kids. They'll be learning! To check out the research, click here. From ScienceDaily (Aug. 13, 2008): Researchers at the University of Amsterdam (UvA) have demonstrated how much the brain can learn simply through active exposure to many different kinds of music. "More and more labs are showing that people have the sensitivity for skills that we thought were only expert skills," Henkjan Honing (UvA) explains. Special thanks to Kindermusik educator Theresa Case for her contributions to this article. Theresa's Kindermusik program, Kindermusik at Piano Central Studios, is in the top 1% of all programs in the world. Indoor or out, as part of a raucous romp or a well-controlled environment, ball play can be a great developmental exercise for kids as they develop balance, posture control, stability, core muscle strength, and spatial judgment. Not to mention, it's pratically impossible not to smile and have fun when playing with a ball! Need a ball? The Gertie ball is available in our online store, found here. Need some music to inspire your ball play? Do a search for the word “ball” at KI’s new e-Music site, Kindermusik Play. See what you come up with! Kindermusik 30-year veteran and guru Carol Penney shares some thoughts on music in a five-day, five part series. Isn’t it amazing how fast these children in Kindergarten and First Grade are learning, gaining new skills and loving all they can do on their own? It’s easy (and frequently, a relief) to let them do just that – proceed on their own – especially with a younger sibling at hand. I frequently wore the cloak of guilt that surrounds the issue of quality time v. quantity time. I remember stretching the definition of “quality” to include inviting my son to sit at the kitchen table and play a song on his glockenspiel (a simple barred instrument with the musical notes of a scale) while I cooked dinner, emptied the dish-washer, cleaned out the moldy containers in the refrigerator and made tomorrow’s lunches. The best gift you can give anyone is presence – unencumbered attention and participation, connecting with what they are saying, doing, learning, enjoying. When a young child senses that something is important to you, important enough for you to invest your authentic and full attention, it gains in value, energy, and enjoyment. If you feel you don’t have the skill necessary to participate in musical activities with your child, enroll in a class, like Kindermusik, that provides the knowledge and guidance you might be looking for. Many parents graduate from Kindermusik with their own new musical skills! Kindermusik 30-year veteran and guru Carol Penney shares some thoughts on music in a five-day, five part series. Check back with Minds on Music each day for the next post! When my boys were toddlers, I perfected the art of clenching my teeth as I encountered strong will, defiance, and creative problem solving that usually involved something dangerous (we've all see the chair with three books precariously stacked on top while little hands reached for the cookie jar). I also discovered how quickly my locked jaw could transform into a melted heart. Toddlers are so darn cute! It was frequently hard to stay present for all that adorableness as I juggled the responsibilities of family, job, church, and neighborhood. As I hang around toddlers — perhaps to continue my grandmothering internship — I'm amazed at what I'm learning. Jumping, for example, is filled with a therapeutic joy! Songs, movement, and rhymes are always a hit, no matter the mood or time of day. And, not coincidentally, these activities create the foundation upon which music skills are built. • Movement — moving large muscles promotes both learning and the development of steady beat. Toddlers especially love movements that challenge, such as jumping and galloping. Add a stopping part and you’ll be rewarded with spontaneous giggles and great partice of self-control. • Sing, sing, sing! — no training necessary…only the joyful enthusiasm that your toddler will model. From "The Wheels on the Bus" to "Yellow Submarine" to some silly nonsense song you make up, singing creates sweet moments, fosters creativity, and establishes a great sense of pitch. Check back tomorrow for part 4 of the series! I can barely remember a time that “mothering” (to my boys of 26 and 30) hasn’t been a prominent presence and driver in my life — celebrating, worrying, guiding, overcoming obstacles, desiring involvement, cherishing the hug/call/email/text, and so on. More and more often, I experience “ahhhhh” moments as I realize my hand is off the tiller. They are launched — living beautiful, independent lives, and I am humbled to have played a part. I often think about what I learned as a mom, afforded by the hindsight of age, experience, and 30 years of Kindermusik involvement. I also visualize who I will one day become as a grandmother. The consistent thread through it all: music! It’s the panacea for many of the challenges that wreak havoc as children grow up. It calms babies. It brings joy to toddlers. It builds confidence in preschoolers. It develops far-reaching and long-lasting skills that grow musicians, creative problem solvers, and confident lovers of learning. My single best advice for young parents? Let music permeate your home (and car)! Music makes parenting more joyful. Music helps children unfold into wonderful, responsible, caring adults. And you don’t have to be a musician to bring music in your child’s life — just participate and enjoy singing, dancing, and listening together! Check back tomorrow for part 2 of the series! perseverance, confidence, responsibility, identity and self-esteem, discipline, love of music, art, culture, identification of talents, using time wisely, teamwork, following directions, intellectual and social development, precision and motor control, overcoming fears in public speaking and shyness, commitment to excellence, creativity, and self-expression. Music is so important. Research supports this claim, and we at Kindermusik see it first hand every day. So make sure your child is getting exposure to music. It's a vital piece of the learning puzzle.